Wow, these weeks just fly by. While sweetheart and I were on our trip to the coast I found a wonderful shop in old town Eureka. The shop sells beautiful clothes from Scotland and Ireland and other specialty items. I was so excited when I spotted this adorable tea cozy. I love going on trips and finding wonderful things that I can enjoy long after our trips are just a memory. 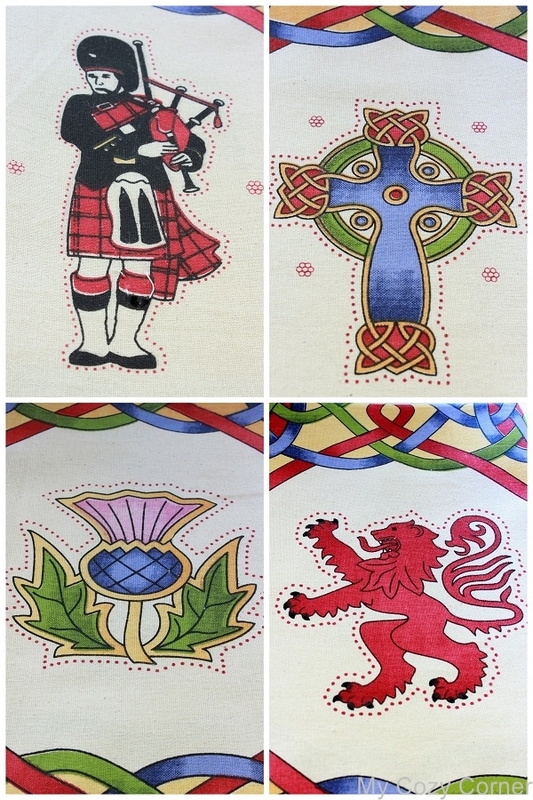 I also found a tea towel with four different symbols representing Scotland's heritage. I set the tea table with some shortbread, fruitcake and raspberry filled cookies from Tuesday Morning. I picked my zinnias and blue delphinium for this bouquet. I love my flowers...Even when the weather is so hot outside you could fry and egg on the sidewalk the little darlings just keep blooming. I think this photo looks like a watercolor. 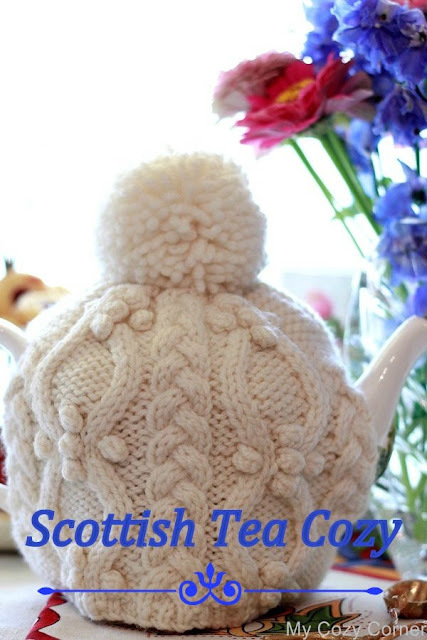 The white tea cozy is made of wool and the pom-pom on top reminds me of the pom-pom on the top of my Scottish tam. The beautiful cable design is amazing. Thanks for visiting today. I hope you have a wonderful week. Thank you so much~I had an e-mail regarding ads popping up. So sorry if this happens to anyone. Well I am ready to go to Scotland. Your table and china were just great. Come visit my blog and look around. Betty, I love your tea cozy! I haven't seen one as unique. Love the pom-pom. Your Scottish teacup is lovely and so are your treats and tea towel. What a pretty bouquet too. Lovely posting and thank you for sharing it at my little tea party. Lovely post. Beautiful tea cozy. I would love to have the pattern. Have a wonderful week! There is a Scottish store in the outlet mall near us but so far no tea cozies and this one is sweet. What a super cute cozie! Your tablescape is amazing, but I have to say I am coveting the tea cozy! Beautiful! Love it! We used to holiday yearly in Eureka at the Gingerbread Mansion as we knew the owner! Love your Aran tea cozy and the tea towel is wonderful. The teacups are gorgeous and your tea setting is just perfect! Thanks so much for linking to Tuesday Cuppa Tea! This is a lovely tea party. The tea cozy is so nice and somehow make me long for winter (?)! That tea cozy is VERY cool. I recently saw that Scottish Thistle pattern while out antiquing. What great items you shared and I love Afternoon tea trays. These are lovely photos of everything! I am so glad you shared this! Your Scottish tablesetting is so very lovely! Thistle tea cups are wonderful and I hope to happen upon one some day.